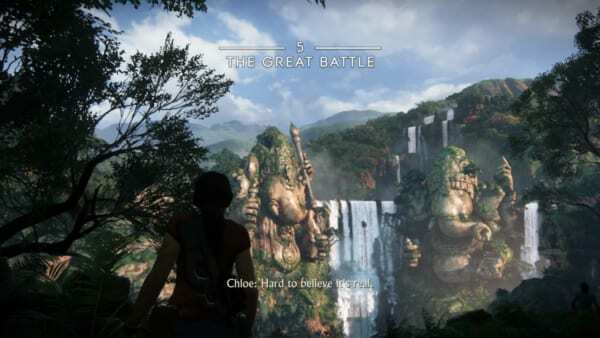 This page contains a walkthrough for Chapter 5 – The Great Battle for Uncharted: The Lost Legacy, including main story objectives, obtainable weapons., equipment and items, and characters and enemies encountered in the game. You’ll start Chapter 5 – the Great Battle in a cliff top overlooking a glorious view of the Ganesh statue. Head right and walk until you see the waterfall very near you. Jump down. Look for the ancient box to the left. Use the tree branch up above you to swing across to a small arch. You’ll see a couple of climbable bars on the right side of the cave. Climb up. Head up the top, and jump to the platform on your left. Turn right at this point and use the tree ahead to get on the statue’s hand. Climb up the hand and start working your way towards Ganesh’s neck. Once you fall down, move left until you see the tree branch. Swing to the second hand. Go up with the help of Nadine. Find the next tree branch, near the statue and land just close to the hand. 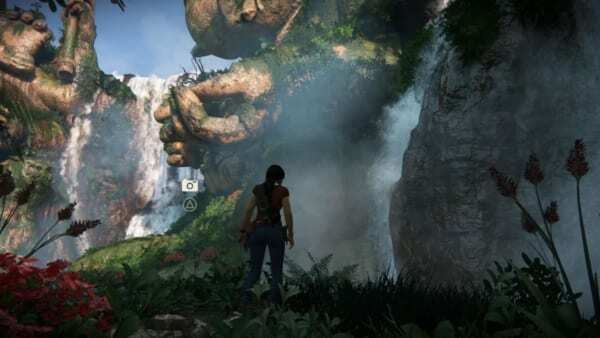 Head up the statue and use the rope to swing to the right hand. Climb up the weapon in the hands of this statue. Keep going up. On the top of the axe, you’ll see a tree to the right. Use your rope to swing to that tree, then swing to the other tree nearby and finally swing towards the area on top. Once you’re there, climb up to the crown, heading towards the head’s backside. Here you’ll find the cave entrance. Jump into the cave. Using the rope, climb down, down, down, down, down. Make sure to take note of the glorious view of two gods clashing with one another. Land on Ganesh. Left of Ganesh, you’ll see a shining object. You can get there by using the tree branch nearby. Climb the rope down and get the glowing object. There isn’t much here, so enter through a small hole to the left of the right door. Follow the passageway of skeletons until you see a yuuuuuuge room with a locked door. This won’t be your puzzle. Interact with it to enter the room. Take a look at the broken wall at the right of this torch room. Head through the next room via this wall. This room is full of skeletons. Head right through the broken wall. Take a right to find yourself in a puzzle room. Push the lever to activate the puzzle. 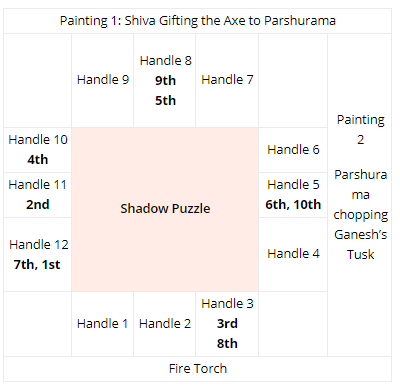 This puzzle illustration is based on Gamepur’s puzzle solution. Head through the next room to see Chloe using the artifact. The building will start to collapse. Keep climbing upwards. Keep jumping up towards Nadine. Head right and follow the stream. Cross the stone wall and swing via the tree to the next platform. After you climb to your left and fall down. You’ll have to fight Asav’s soldiers. Make sure you take cover from the vehicle with the guns and follow Nadine. Keep following Nadine, entering a wooden structure. Once inside, head right down a path, and left through a cave. Head through the cavern to find yourself in a room with a metal gate. Climb that to find an area with a wall you can pass through. Asav barges in for another fight. You can’t use weapons in this match, so make sure you avoid being hit by his strikes. Since Asav is too powerful, your best strategy should be simply to avoid all his attacks until the set time where he throw you two in the waterway. Make sure you get your L1 ready, because you’ll have to use the rope at the tree down the waterway or you will fall to your deaths. Use the rope to reach safety straight ahead. Follow Nadine, turning right down the path and walking until you find the side of the rock surface. Climb up. Climb via the ledges until you find a lever. You’ll discover a new area, and fight with Chloe.